Snakes are cool, and we’re not just talking about the temperature of their blood. They have become very popular lately. As a veterinary practice with a long history of providing herpetological care, we at PAH are used to seeing our share of snakes. But we’re now meeting more scaled pets than ever before. It could be their generally placid temperament. Or the fact they don’t have to be exercised. Kept amused. Or groomed. That they don’t make any noise. Or that they’re a whole lot more interesting than a dog or cat. However, since all that has always been true, we think it probably has more to do with the recent relaxation of licensing laws. Licenses – Before you go running down to your local pet shop to buy a snake, there are a few things you should know first. For starters, while they may be able to help you arrange to buy a snake, pet shops in NSW are not licensed to sell reptiles. Breeders and specialised dealers are. And speaking of licenses, you’ll need one too. The Department of Environment and Conservation issues two types for reptile owners. A Class 1 license costs $60 for up to two years, can be issued to people 10 years or older and covers such easy-care snakes as the diamond python. 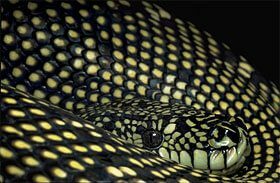 A Class 2 license is for reptiles that are rare, dangerous and/or hard to look after. While it also costs $60, this license only lasts one year and you have to be over 18 to get one. We should also add that it is illegal to take snakes from the wild. For more information, check out the website of the NSW Department of Environment and Conservation. By far, the most popular snakes around here are diamond pythons, a sub-species of carpet pythons. Then come carpet pythons in general and Children’s pythons, named for John G. Children, the scientist who first identified them. All are natives. Most are nocturnal. None is venomous or normally aggressive, though carpet pythons might be a little more inclined to bite. And in case you weren’t sure, Australian pythons never grow big enough to eat you. Pythons have a lifespan of 25 to 30 years. Children’s pythons grow up to 1.6 metres in length, diamonds to 2.5 metres. They cost from about $250 to $1,000. And they must be kept indoors in a climate-controlled terrarium. Housing – Ideally, terrariums should have at least two sides made of glass or perspex and a secure, wire-mesh lid. (Stay away from wire-lined terrariums.) It should be large enough to provide your snake(s) plenty of room to stretch out, bask and move around. For Children’s pythons the enclosure should be at least 60cm long for two specimens. 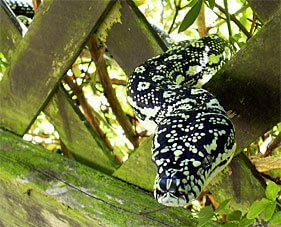 Since they are tree-dwellers, carpet pythons (diamonds included) should have a higher cage with branches to climb. An easily cleaned water basin is essential; these snakes drink often. A rock or rough piece of bark for your snake to rub against when shedding its skin is also a good idea. The floor should be covered with large gravel and/or newspaper or kitty litter. The latter not only is absorbent, it holds heat well and can be used as mulch afterwards. A detachable bottom will make cleaning that much easier. Hiding. Because snakes are deaf and do not see well, they like to feel well protected. So you should provide hiding places such as a terracotta pot, box or hollow log, even a pile of leaves. For carpet pythons the hiding places should be fairly high up. Other than that, the decoration of the terrarium is best kept to a minimum. Heating. Snakes need to be kept at a temperature between 20° and 28°C, with a gradient from one end of the terrarium to the other. This means placing a thermostatically controlled heat lamp at one end out of the reach of your snake(s). You can use a red or blue light to provide heat at night. Another good alternative is a heat pad placed below the floor or the terrarium. You should also use a special reptile UV light to create a day/night cycle. Either that or allow your snake(s) access to direct, unfiltered sunlight for at least 30 minutes every day. If the temperature inside the terrarium becomes too high, the snakes will often lie in the water basin. Remember that in the summer months the ambient temperature can be sufficiently high so that the heating may be switched off and the snakes kept at room temperature. Feeding – Most pet shops sell a variety of frozen rodents from ‘pinkies’ (hairless baby mice) through to fully grown rats. When thawed, these are fine for Children’s pythons, the choice depending on the size and age of the snake. (The one to the left is a hatchling.) We also recommend adding a vitamin. Carpet pythons are a bit fussier, preferring their meals – mice, rats, guinea pigs or chickens – to be warm-blooded. It’s a good idea to make sure these animals are dead when fed. Live rodents have the potential to injure, even kill, snakes. The RSPCA recommends killing the prey-to-be humanely immediately before feeding. If necessary, you can use a pair of tongs to move the prey so it appears to be alive. Because obesity is a major problem with pet snakes, you should feed yours no more often than once a week with the frequency increasing during the hotter months or when the snake becomes more active. A good gauge of a sensible meal would be a small swelling in your snake’s mid region. Incidentally, if you have more than one snake in a terrarium, they should be fed separately. Otherwise, they could be encouraged to compete and become aggressive. Handling and General Care – Several times a year your snake will slough (shed) its skin. You’ll be able to tell when this is about to happen by the skin starting to appear dull and the eyes turning milky and opaque. You should be extra careful when handling your snake during this stage; the new skin underneath can be quite fragile. Your snake will also be feeling a bit temperamental and could be more likely to bite. Often, it will go off its food. As noted above, providing something for your snake to rub against can help the process along. However, if some skin refuses to be shed, a 10-minute soaking in warm water should allow you to gently pull the skin clear. Never use force and never leave your snake unattended while soaking in the water. Proper handling is critical. In fact, if you’re a novice, the best thing to do is take a lesson from someone who is used to handling snakes. Though they’re normally placid, rough handling affects snakes the same way it affects any of us. If they feel threatened and/or frightened, they are very likely to bite. And although the bites are non-venomous to humans, you should still seek medical attention to prevent infection. Wash your hands and wear clothes that do not smell of other animals. Make sure your snake is aware of your presence before going to pick it up. Move slowly and do not grab at it. Hold your snake by supporting its belly. Stomatitis (Mouth Rot or Canker). Mouth rot usually results from poor husbandry and sanitation practices. In some cases it will appear when a snake’s immune system has been weakened by a concurrent disease (e.g., pneumonia), low temperatures or excessive humidity. The signs: accumulation of cheesy material along the gums and around the tongue sheath • blood spots and bruising in the gums • an inability to shed skin • dribbling saliva • in severe cases swelling of the gums and subcutaneous tissue along the jaw may be seen, possibly spreading to much of the head and neck. In the early stages gently cleaning the affected tissues every day with dilute iodine or chlorhexidine followed by dressing with Silvazene® cream will control mouth rot. Just be careful to hold your snake’s head downward so that the fluid doesn’t enter the throat. In more advanced cases we will have to inject anibiotics. Naturally, the substandard conditions that caused the problem will also have to be addressed. Necrotising Dermatitis (Scale Rot) and Vesicular Dermatitis (Blister Disease). Generally, scale rot results from unhygienic conditions and excessive dampness, most commonly affecting reptiles that come from dry, arid regions of Australia. Occasionally, a deficiency of vitamins A and C can be a contributing factor. The signs: yellow, red or greenish-black discolouration of the scales, particularly along the underside • softening or swelling of the skin surface caused by serum seeping through • sloughing of affected skin exposing subcutaneous tissue • fluid-filled blisters in the scales, again primarily on the ventral surfaces • bruising due to blood in the tissue beneath the scales in advanced cases. The first thing to do is bring the snake to us so we can determine the underlying cause of the disease. We will probably begin with a course of antibiotics and fluid therapy. If the infection is particularly deep and extensive, we will have to cut or clean away dead tissue under anaesthesia. You should continue treatment by cleaning affected areas of the skin every day with dilute povidone iodine or chlorhexidine, then dressing with Silvazene cream or Dermaclens® cream. Pneumonia. Respiratory disease or pneumonia is quite common when conditions are too cold or damp for pet reptiles. 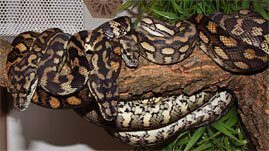 Especially susceptible are diamond pythons that have been kept outdoors during the winter and reptiles from arid areas being housed in enclosures with too high a level of humidity. While the condition is normally the result of a bacterial infection, lungworms, fungal disease and tumours can also cause similar signs. Diagnosis may require a lung wash or radiology. 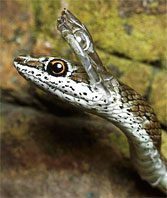 The signs: open-mouthed breathing • resting of the head in elevated positions • tongue tips stick together or snake is unable to flick its tongue • gurgling sound while breathing • accumulation of frothy mucus at the back of the throat. We begin treatment by injecting antibiotics and fluids under the skin. In severe cases we may use intramuscular injections to help dry oral secretions. Ectoparasites (Mites). Extremely common and bothersome, snake mites are usually found around and underneath the scales of the head and neck. 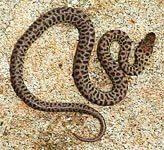 They attach to the skin and feed on the snake’s blood, breeding profusely in conditions of high heat and humidity. They can infest not only your pet but also every crack and crevice in the terrarium and its furnishings, as well as any other terrariums in the room. The signs: snake lies in the water bowl • excessive rubbing against terrarium furnishings • skin shedding is slow, uneven or doesn’t happen • presence of very small red-brown insects on skin • when white pillowcase is placed in terrarium overnight, mites will be visible moving slowly on the bottom the following morning. Once they’ve established themselves, these mites are extremely difficult to get rid of. You should remove all reptiles from their terrariums and quarantine them for the duration of the treatment. Rather than try to physically remove each mite, strip and thoroughly clean all infested terrariums with a mixture of soapy water and bleach, then leave to dry in full sun. Discard all porous furnishings and substrate. At present no treatments designed for killing mites on reptiles are actually registered for this purpose. While herpetologists often use Ivermectin, Orange Medic, Frontline Spray and Pyrethrins, they must do so very carefully. These products are quite toxic to snakes. More information – We have covered some of the more important considerations for owning a snake on this page, but there’s a lot more you should know. We suggest reading Care of Australian Reptiles in Captivity by John Weigel and/or joining a herpetological society. And, of course, you can call Bryn Lynar, our resident snake vet.